Residents’ Club in Tucker Hill Now Open! Over 200 residents joined the celebration on May 23, 2017, as Southern Land Company President Brian Sewell and other project leaders hosted a Grand Opening Party for Tucker Hill’s Residents’ Club. This new building opens up even more common area space for residents to enjoy as it now adjoins the resort-style pool and a manicured grassy lawn. 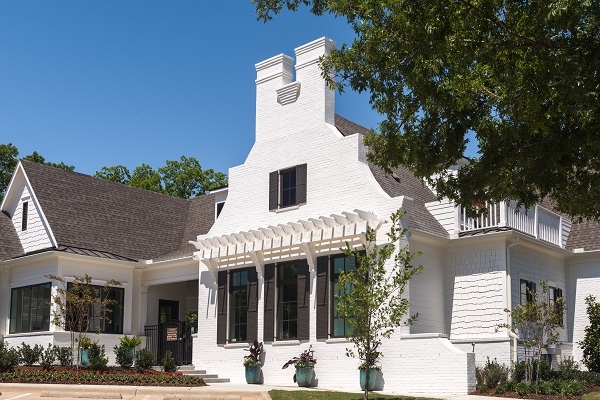 Designed by Southern Land Company in collaboration with local architect of record Hudson Lockett and built by Vintree Development, the Dutch Colonial inspired design includes over 2,300 square feet of air conditioned, furnished indoor space as well as another 1,400 square feet of covered outdoor patio space that also features outdoor furniture and ceiling fans. The main indoor area consists of a large community room with reception space for neighborhood events and a multi-purpose room complete with large conference or dining table for smaller gatherings. Special features include two wall-mounted televisions and a serving bar with warming drawers, dishwasher and bar sink. A separate indoor café kitchen features a pass-through window for easy patio and pool-side service, bistro tables, another wall-mounted television, full-size refrigerator, dishwasher, and plenty of storage. This building is a showcase within itself as it features many of the same architectural and horticultural design elements found throughout the community. Residents may rent the space for private parties and it will be home base to many Tucker Hill resident events planned by the community’s Lifestyle Coordinator. Find out more about the Residents’ Club as well as view some photos here! “We are thrilled to now offer this exciting new amenity to Tucker Hill residents,” said Tim Downey, Southern Land Company CEO.